I’m always looking for good looking, healthy recipes to try out. I get bored with the same old, hum drum recipes. I found this recipe in All You Magazine and ripped it out to put with my grocery shopping list. Then, when the opportunity came up for me to work with the Mom It Forward Blogger Network, I knew it was the perfect time to use this recipe! Nowadays, finding good sources of protein for my family is so important. My husband, son, and I are working on limiting our carbs and sugars and increasing our protein. 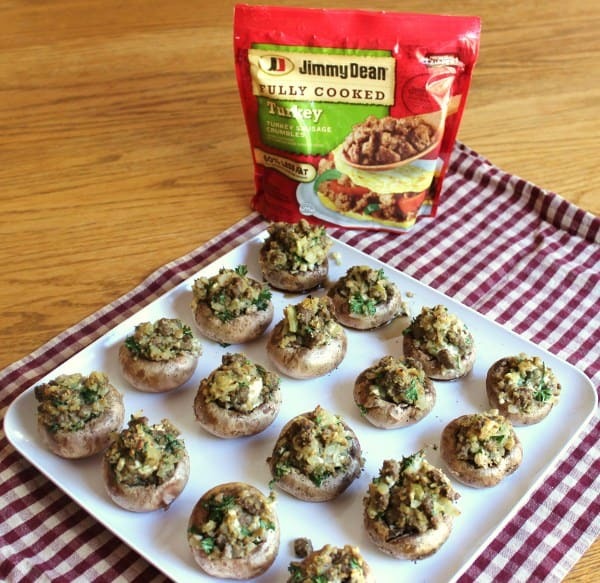 This recipe for Stuffed Mushrooms, Jimmy Dean Style totally fits the bill. At 8 grams of protein per serving, this is a healthy, fill-you-up kind of appetizer. 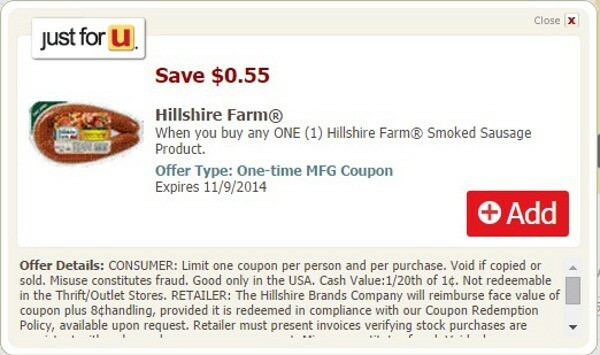 Disclosure: Today’s post is sponsored by Hillshire Brands™, all recipe ideas and opinions are my own. If you have a Safeway Club Card and you sign up for Just For U, you have the opportunity to receive personalized deals, coupons and club specials. Once in your Just For U account, all you have to do is click the ones you want to be added to your club card. So when you go grocery shopping and use your club card at the register, the deals automatically show up on your receipt. Also, with Just For U, you can create a shopping list with the items you select. After loading my coupon for Jimmy Dean Fully Cooked Turkey Sausage Crumbles onto my Just For U account, I went to Safeway to get it, along with my other ingredients. I altered All You’s recipe a little bit to make prep time quicker and easier. 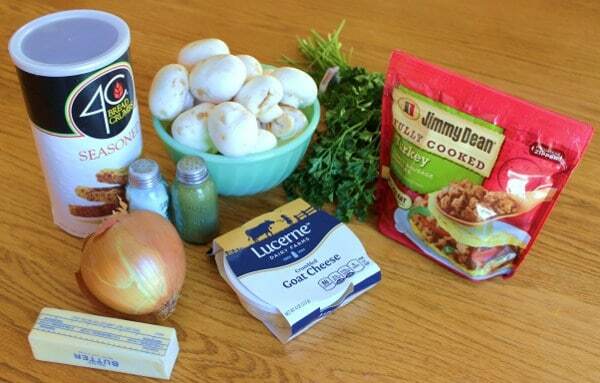 Instead of using ground turkey, I used the Jimmy Dean Fully Cooked Turkey Sausage Crumbles. 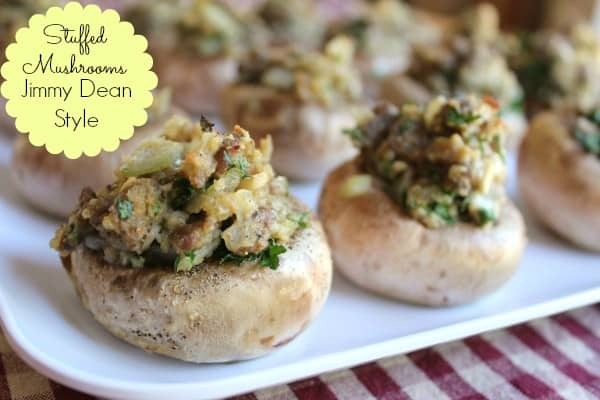 My hubby loves anything that involves sausage, so I knew he’d love this recipe. I also chose to buy from Safeway the already crumbled goat cheese instead of buying it whole and crumbling it myself. Mist a 9x13 baking dish with cooking spray. 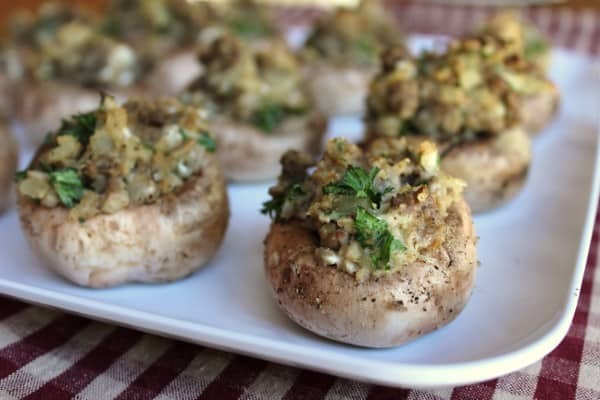 Arrange mushrooms, cavity side up, in dish. Melt butter in a medium skillet over medium-high heat. 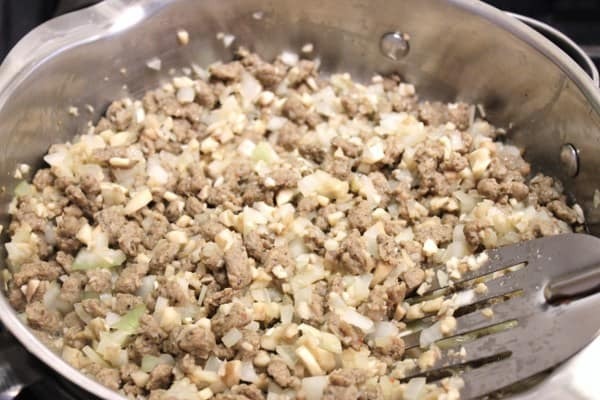 Add onion, chopped mushroom stems and turkey sausage crumbles. Sprinkle with salt and cook, stirring often, about 5 minutes. 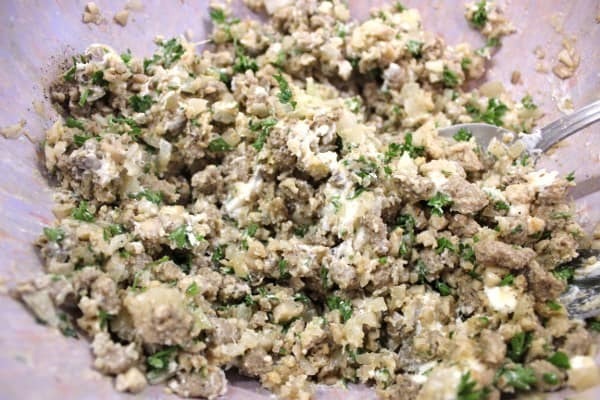 Transfer turkey sausage mixture to a bowl. Let cool for 10 minutes, stirring occasionally. Stir in bread crumbs and parsley. Sprinkle mushroom caps with salt and pepper. Spoon filling mixture into mushrooms, piling in center. Bake until lightly browned on top, about 15 minutes. The below picture is the turkey sausage mixture before transferring it into a bowl to cool. This is the mixture after the turkey sausage mixture cooled and the remaining ingredients were added and mixed. Ready to stuff the mushrooms! And here is the final product! Don’t they look absolutely divine? My husband almost grabbed one before I could even finish taking pictures. They were so good! The perfect amount of each ingredient. 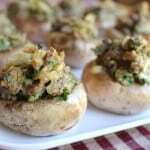 I truly believe using the Jimmy Dean Fully Cooked Turkey Sausage Crumbles instead of ground turkey made these stuffed mushrooms more tasty. To save even more time chopping (and save some tears), you can buy the already chopped onions. 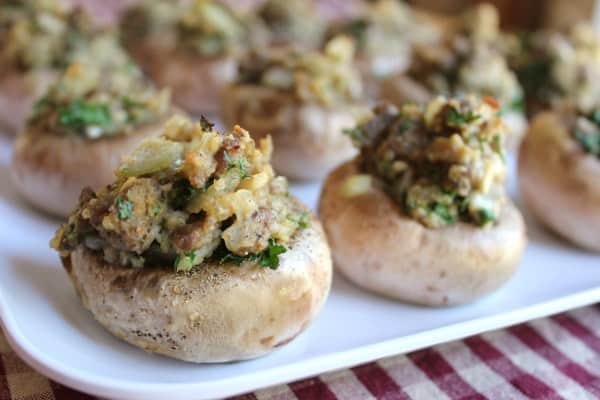 These stuffed mushrooms would be perfect for your next football game gathering, wine tasting party, or potluck event. 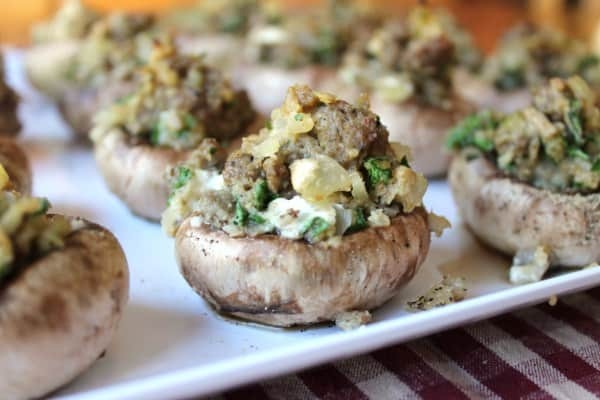 Yum, these look so good and you’re right, perfect for a party, especially with the holidays coming up. I will definitely try them–thanks!! These reminded me of you Cheryl! Amazing appetizers are your specialty.